Welcome to Shakya Handicraft-Dharma Store. 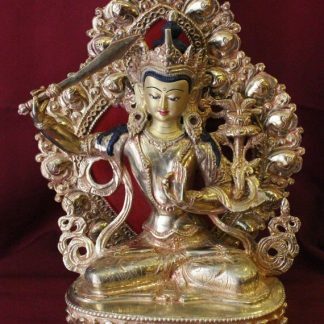 We manufacture and export Buddha Statues, Singing Bowls, Tibetan Thangka Paintings, Buddhist Rituals items, 925 Silver Jewelry, Tibetan Rugs and many other Buddhist supplies. We are a group of manufacturers so we can provide you products with wholesale factory prices depending on your requirement and size of order. If you have any questions feel free to Contact Us. Products in our dharma store are all high quality handmade items. Please do check our items and purchase with confidence as we have very good shipping and refund policies. We accept all kinds of payment credit card, paypal and bank wire.We are always there to help you out. Making of a Buddha statue is a time consuming process that requires great skill and patience. Completing a Statue can take from 3 months to 6 months time. In case of large Buddha statues it can take even up to years of time to make it. It takes effort of many different kinds of artisans to accomplish it. Artisans specializing in making wax models to those who cover it in clay and go through the process of casting. And at the other end efforts and skill of carving artists, gold plating and painting artists have their own role significance. Our Buddha Statues are primarily made of copper. We use the method called “Lost Wax Method” for casting these Buddha Figurines. It is known as Lost Wax method as the original wax model is drained out by heat from the mold and is LOST into the form of metal. In our case copper. There are mainly three major steps of casting a sculpture and two other steps to completing a Buddha statue. Metal casting a Buddha statue. Polishing and Finishing a Buddha Statue with either plain copper or gold plated body. 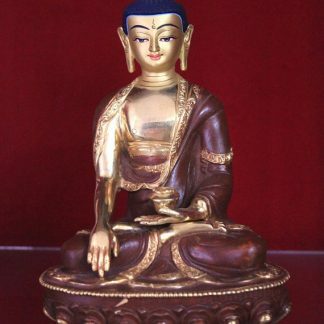 The Buddha sculptures can also come in antique look or plain copper statues. In case of plain statues they are finely carved and polished to give natural look. In case of antique look finishing they are oxidized in dark or light brown color or combination of two color. Here are the examples of the statues from our dharma shop. History of Tibetan Bowls goes back to the 8th century A.D. The singing bowls also known as Magic Bowls are considered to be a long lost forgotten art. According to the analysis of old bowls, it reveals that they were made from a variety of metal alloys consisting silver, gold, nickel, copper, zinc, antimony, tin, lead, cobalt, bismuth, arsenic, cadmium, and iron. One of the highest quality bowls are made of the combination of seven metals among the described ones above. Very few manufacturers make such genuine bowls nowadays. However, we are proud to introduce you the very same bowls that ancients used to make, genuine seven metal bowls. 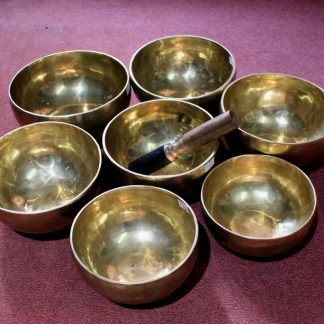 Our Singing bowls are one of a kind high quality bowls made of seven metals. They are hand-hammered and hand-carved in Nepal. There are mainly two types of singing bowls. One is Plain seven metal bowls and other is carved bowls. 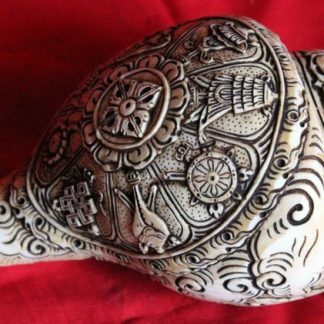 Carved designs come in many different Tibetan Buddhist symbols. Most common one is Tibetan Om Mani Mantra Symbol carved either in the centre of the bowl from inside or at the back or outside back of the bowl. It can also be carved around the side rims of the bowl from both inside and outside. Here are the examples of carved bowls with Om Mani Mantra. Besides Tibetan Om Mantra bowls other designs can also come. They can come either separately or in conjunction with Tibetan Om Mantra. The designs like flower of life. Buddha eyes or also called Swoyambhu eyes, chakra and other symbols like conch shell or shankha, dourje, double dorje etc. Here are the examples of the bowls in our dharma store. On the other hand there are plain bowls like these. They can come shiny or in antique look where the bowls are treated to make them look old. But these are not really old bowls. They can either come individually or in a set of seven chakra bowls with their corresponding 7 (seven) chakra notes C, D, E , F, G, A, B.
Sizes of these bowls can come in different size. They can vary from 5cm in diameter to 45cm -60 cm and even 90 cm in diameter. Custom sizes can be as bigger as you need or want. There are two methods of playing singing bowls, either by rubbing a mallet around the rim or by striking the side of the bowls with the mallet. Both the methods produce quite distinctive sounds. The sound of a singing bowl starts peacefully and builds up steadily. The prime idea is deep relaxation that provides you to contact with your inner self. Sound is vibration, and that vibration moves throughout your body. The sound vibration of the singing bowl arouses cellular memory and permeates the sensation with the healing energy. Some of them also vibrate with certain altered brain states. The sound resonating from the singing bowl is very pure and potent in centering the mind and the body. These sounds have a profound impact on energy body of living beings, but also on the environment in general. The legends say that the secrets of sound coming from a singing bowl yield so much power that they must be kept hidden. Tibetan Thangka is considered timeless art with eternal truth. It represent history art and Buddhist teaching in the form of visual art. Though thangkas are famous as Tibetan Thangka the orgin is ironically not Tibet. Most of Tibetan Thangkas are not created in Tibet. They are painted in Nepal. It is the original source. The artisans of Kathmandu valley deserves credit for preserving and developing this ancient Buddhist art. Tibetan Thangka market in Nepal are currently concentrated Patan, Baktapur , Basantapur and Thamel of Nepal. Lama aritsans are particularly famous for painting in Tibetan style. However there are Newar artisans as well who paint in Newari style thankgas also known as Pauba. Patan produces the finest Thangkas for export, and most of the local artisans depend on local tourists, local monasteries and Buddhist followers. In addition to that international monasteris and Buddhist followers also import thangkas.Not surprisingly the Thangkas made in Nepal are in great demand around the world. Thangka- an ideal example of Buddhist artistry and philosophy. A powerful source of Buddhist Philosophy and meditation tool. A fine piece for adding oriental beauty to your private life. A timeless and precious gift to a person you love. A decorative piece in your home lobby and living room. A symbolic piece for placing in your altar is definitely somthing you will never regret in acquiring. There are however many different styles of thangkas. To learn more you can check our guide here. Thank you so much. Received the statues today. Beautiful buddha statue love it !! As you can tell; it looks beautiful. It sounds great too. Clearly Amogh and his shop are wonderful as I have returned, and will return to shop here again!! I love the singing bowls! They sound amazing! Very fast shipment and items were wrapped and packaged perfectly. Thank you. Beautiful statue. Very happy with the purchase. Thank you.